Did the Ancients Base Their Dinosaur Drawings on Fossils? New Christian Evidence Book Released! The small, obscure town of Acambaro in the state of Guanajuato in Mexico houses one of the most unique antiquities collections in the world. In 1945, a German hardware merchant named Waldemar Julsrud happened across a half-buried clay figurine at the bottom of a mountain known as el Toro (the Bull). Julsrud was no stranger to artifacts of ancient civilizations. 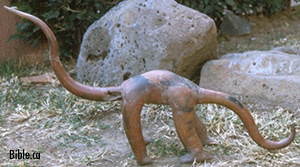 He owned one of the most valuable and extensive collections of Chupicuaro pottery in existence. Charles Hapgood noted: “Mr. Julsrud possesses at the present time one of the best collections of this pottery (Tarascan—KB) in existence, comprising several hundred pieces” (1955, 2:1). [NOTE: At the time, the pottery was believed to be Tarascan, but was later assigned to the pre-classical Chupicuaro culture (800 B.C. to A.D. 200) (see Swift, n.d.[a]).] But the newly discovered ceramic figurines did not match any ancient civilization with which Julsrud was familiar. The ceramic figurines intrigued Julsrud and he wanted to know if more were buried nearby. He made an arrangement with one of his employees, Odilon Tinajero, to dig in the area in an attempt to find more pieces. Julsrud agreed to pay Tinajero one peso for every figurine that was complete, or could be easily put back together. In all, Julsrud eventually collected over 33,500 figurines. The sheer number of figurines was enough to turn heads, but the fact that many of the figurines depicted reptiles that closely resembled dinosaurs in direct contact and interaction with human figures was even more startling to the scientific community. Furthermore, the apparent antiquity of the find predated modern dinosaur fossil discoveries by hundreds of years, so any accurate information regarding dinosaur anatomy would have necessarily been from the ancient civilization’s interaction with the creatures. A few months later, in 1952, William N. Russell made a trip to Acambaro and wrote about the amazing figurines. His article, “Did Man Tame the Dinosaur?” appeared in the February/March 1952 issue of Fate magazine. In that article, Russell mentioned that Julsrud had collected 26,000 pieces, which filled the rooms of Julsrud’s house. Russell said that “[t]here were thousands upon thousands of the weird objects” (1952, 5:23). From his observations he concluded that there were no duplicate pieces. “Each is either hand-molded, hand-carved or both,” he said (5:25). Russell stayed several days to interview Julsrud. He concluded with these words: “We cannot expect hurried pronouncements of authenticity. But, in my opinion, nothing should becloud the evidence that Julsrud’s objects are very old” (5:27). Chemical tests were made of the soils composing the figurines. Sherds were crushed and the contents were inspected for any inclusions that might give a clue as to the date of manufacture. Laboratory tests proved nothing. It was therefore decided that a representative should be sent into the field to witness the actual excavation of the figurines (1953, 18:388). It is interesting to note that the Amerind Foundation could not conclude that the sherds were recent fabrications from the chemical tests they performed. The Amerind Foundation, Inc., was prevailed upon to make an investigation of the materials. To imply falsification merely on the strength of the life-forms represented was not sufficient, for there was always the bare possibility that the figurines were chance similarities to Mesozoic forms as defined by modern scientists in the last two hundred years. It was within the realm of chance that they were the work of some imaginative prehistoric artist who may have taken his inspiration from the smaller reptiles still in existence today (1953, 18:388, emp. added). Notice the implications of DiPeso’s statements. First, he approached the find with the idea that its authenticity was only a bare possibility. Then, he did not even consider the possibility that the ancient artist might have actually seen dinosaurs. He only admitted the chance that the ancient artist might have copied small, living reptiles and elaborated upon them. What would you expect someone with this kind of bias to conclude when he witnessed pieces in the collections that looked like known kinds of dinosaurs? His bias would force him to deny the collection’s authenticity. Further, none of the specimens were marred by patination nor did they possess the surface coating of soluble salts.... The figures were broken, in most cases, where the appendages attached themselves to the body of the figurines.... No parts were missing. Furthermore, none of the broken surfaces were worn smooth. In the entire collection of 32,000 specimens no shovel, mattock, or pick marks were noted (1953, 18:388). DiPeso also stated: “Further investigation revealed that a family living in the vicinity of Acambaro make these figurines during the winter months when their fields lie idle” (1953, 18:388). DiPeso further claimed that the hole from which he watched figurines being excavated showed signs of recent digging prior to the excavation and signs of figurine “planting.” He concluded: “Thus the investigation ended: it seems almost superfluous to state that the Acambaro figurines are not prehistoric nor were they made by a prehistoric race who lived in association with Mesozoic reptiles” (18:389). Several suspicious aspects of DiPeso’s trip troubled those who wanted honest answers about the figurines. First, DiPeso spent little more than two days for his entire investigation. He only watched a tiny fraction of the figures be excavated. Second, he claimed to have inspected the entire collection of over 32,000 pieces, but he was only in Julsrud’s house for about four hours. Furthermore, he did not take time to learn the method used by the excavators. Nor did he attempt to locate an undisturbed site to excavate. His conclusions had every sign of a trumped-up, predetermined expedition designed to refute the collection from the start. It is ironic that DiPeso’s “research” is used most often to refute the authenticity of the collection, yet every one of his points was satisfactorily answered soon after his report. Now, Professor Hapgood is an interesting individual. He is essentially fair-minded, well-balanced, and not given to hasty decisions.... Professor Hapgood had started out studying history; then he had specialized in history as it affected primitive man. He became an omnivorous student and an outstanding authority in his field. His name carried great weight. Today he is an authority on ancient civilizations (Gardner, 1969, p. 13). Hapgood had the credentials to inspect the Julsrud collection. Hapgood’s initial report was published in December 1955, now a very rare document that is extremely difficult to find. In it, he stated the reason for his investigation. Referring to DiPeso’s expedition, Hapgood said: “The previous investigations, extremely limited in character (one lasted half a day and the other two days) have failed to prove anything. Their evidence is purely negative and entirely inconclusive” (1955, p. 3). In the report, Hapgood addressed each of DiPeso’s contentions. DiPeso stated: “The figures were broken, in most cases, where the appendages attached themselves to the body of the figurines.... No parts were missing.” In response to the breaking of the pieces at their appendages, Hapgood noted: “But what would be more natural than for pieces to break at their weakest points?” (1955, 5:7). Furthermore, concerning the missing parts, he said: “As for missing parts, I have personally inspected a number of large boxes which are completely filled with parts of figurines that could not be put together because parts were found missing” (1955, 5:7). Hapgood’s testimony coincides with that of other observers of the collection. William Russell said: “Julsrud showed me several figurines.... And there were many hundreds of broken pieces stacked in boxes” (1952, 5:25, emp. added). Lowell Harmer, in his article in the Los Angeles Times, recounted his trip to Julsrud’s house, in which he saw “a few wooden boxes of unreassembled parts of dinosaur pottery resting here and there on benches” (1951, emp. added). Harmer further told of how he and Julsrud visited the digging area, where “[h]undreds of broken pieces of dinosaur statues were still scattered among the rocks and the magueys” (1951, emp. added). Concerning broken and “missing” pieces of figurines, Erle Stanley Gardner, recounting his trip to el Toro mountain in Acambaro during the late 1960s, wrote: “Now here I was in for the surprise of my life because, as we spread out along the cut bank of the road, it became apparent that the soil was literally filled with broken pieces of pottery, obsidian knives, and here and there a part of a figure” (1969, p. 232, emp. added). No Digging Marks on Figurines? Furthermore, DiPeso stated: “In the entire collection of 32,000 specimens no shovel, mattock, or pick marks were noted” (1953, 18:388). In response, Hapgood stated: “As nearly as I can learn, Mr. DiPeso spent not more than four hours in his inspection of this collection. I have examined it many hours daily for several weeks, and I cannot claim to have examined more than a small fraction of the objects. Yet I have seen innumerable breaks that could have been made by shovel or pick” (1955, 5:7, emp. added). Concerning DiPeso’s claim, John Tierney wrote: “Amid a host of outrageously false or erroneous observations he made was the claim to have precisely examined every one of the then 32,000 artifacts to determine whether there were shovel marks, a feat which would have required inspection of 133 artifacts per minute steadily for four hours” (1994b, 1:56). When Don Patton and Dennis Swift made a trip to Acambaro, they recounted how they were allowed to see several of the figurines. Swift wrote: “Working at a fast pace, in a six hour period, a little more than eight hundred of the ceramic figurines were unwrapped” (Swift, n.d.[a]). In regard to DiPeso’s claim, Swift correctly noted: “In reality, it would take several days to unpack the massive jumble of intact, broken, and repaired pieces from the boxes. Once the boxed pieces were disentangled and set up with those already on display in the mansion, it would take many more days to even give a cursory examination” (n.d.[a]). DiPeso simply could not have given the collection anything like a close examination in the time he spent. No Patina or Encrusted Dirt? Another piece of “evidence” that DiPeso’s used to refute the find’s authenticity was that the pieces did not have dirt or patina encrusting them. He said: “Further, none of the specimens were marred by patination nor did they possess the surface coating of soluble salts...” (1953, 18:388). Concerning this allegation, Hapgood responded: “I cannot understand why Mr. DiPeso did not find dirt in the crevices of the Julsrud figurines. I found very many figurines, which, despite their washing, still showed such dirt, and in the case of the musical instruments a majority could not be played because their interiors were choked with dirt” (1955, 5:6, emp. added). Swift and Patton commented: “In the process of handling several hundred pieces of the Julsrud collection, the authors have observed pieces that still have dirt embedded in the crevices as well as some patina on the surface” (Swift, n.d.[a]). This is, indeed, remarkable, since Julsrud paid one peso for every complete piece that was washed and cleaned. He did not know that removing patina and encrusted dirt from the figurines would cast doubt on their authenticity. Yet, for all the washing and cleaning that was done, dirt and patina were still evident. The next day we obtained permission to dig inside one of the houses erected on the site. This was owned by Acambaro’s Chief of Police, Juan Mandujano. Since the general site had been so thoroughly searched by the digger over a period of about eight years, it seemed that the best possibility of finding a cache of figurines would be under one of the houses. ‘Planting’ of figurines in that case would also be difficult, if not impossible. So far as I could find out, the house was built about 25 years ago (1930—KB). I found every part of the floor of the house smooth, and extremely hard. The diggers worked through the floor with picks, and I saw the hard layer was about eight inches thick. Under this was a somewhat softer layer of earth, which overlay the original sloping surface of the ground. The original surface was easily discernible in the stratification and was complete. There appeared to be no doubt that the original surface had not been disturbed since the fill was piled on it to level the floor when the house was built.... Below the original sloping surface were found many fragments of pots, and many fragments of figurines. All the figurine fragments were clearly typical of the Julsrud collection (1955, 1:2-3). In one of the most remarkable episodes in all archaeological history, an official team of four Mexican archaeologists, headed by Dr. Eduardo Noguera, Director of Prehispanic Monuments of the Instituto Nacional de Antropologia e Historia, supervised a dig at the Julsrud site in 1954. It admitted (contrary to the claims of DiPeso and Peterson) that the excavations were scientifically valid.... (1994b, 1:54). It seems to me significant that although other good observers have witnessed excavations, no one else has reported fraud. Among previous qualified witnesses were Dr. Raymond C. Barber, of the Los Angeles County Museum, and Dr. Eduardo Noguera. The former, to be sure is a minerologist [sic], although he is interested in archaeology, but Dr. Noguera is the director of Pre-hispanic monuments in Mexico. Dr. Noguera saw objects excavated and found no evidence of fraud in the burial; his subsequent conclusion that there must have been fraud was based entirely on his inability to explain the reptile forms” (1955, 5:9). Even if DiPeso did detect fraud, although it is very doubtful, it would not account for the other excavations that were verified to be authentic by other experts. Furthermore, DiPeso found only about 50 figurines and pieces of pottery during his excavation. How could he discount the entire collection based on a cache of pieces that composed .15% (less than two tenths of one percent) of the collection? Finally, DiPeso stated: “Further investigation revealed that a family living in the vicinity of Acambaro make these figurines during the winter months when their fields lie idle” (1953, 18:388). Several aspects of the collection prove this statement to be false. A significant point to me was that during our excavations the little boys (of whom there were sometimes as many as 17 clustered around us) would keep coming to us with fragments they had found at one time or another on the surface of the ground of the general site, and we would constantly be finding them ourselves. Inasmuch as it hardly seemed likely that anyone would make false figurines, age them, break them, and scatter them on the site to deceive us, I thought that these should be preserved as part of the evidence. These pieces are all typical of the Julsrud collection, encrusted with dirt, many with rootlets or rootlet marks on them, and of two kinds of clay, black and red (1955, 1:4, emp. added). On more careful examination, a group of about sixty musical instruments in the Julsrud collection turned out to be most remarkable. No two were identical in shape. Many of them could still be blown, and had pure and beautiful tones. It was evident that there was a musical scale, the range from highest to lowest notes being very considerable, and the intervals of comparable value. Some instruments had several notes, one as many as eight (1955, 6:6). Making a working musical instrument with eight notes would take much more time than sculpting a crude figure of a reptile. Why would a person take the time to add such detail when he only received a peso for each piece, regardless of its design? The story of this ceramic family has been investigated, first by the municipal authorities, then by the Chamber of Commerce, then by Professor Ramon Rivera.... Both official bodies issued statements that no such family is known in Acambaro or the environs.... No trace of such a family was found by any of these people (1955, 5:9). Francisco Aguitar Sanchaz, Superintendent of the National Irrigation Plant of Solis said, “That on the basis of four years intimate knowledge of the inhabitants of the entire area and of archaeological activity there, he could positively deny that there was any such ceramic production in the vicinity.” The Municipal President of Acambaro, Juan Terrazaz Carranza, issued on July 23, 1952, an official statement No.1109 refuting Dipeso’s [sic] allegation. “This Presidency under my direction ordered that an investigation be carried out in this matter, and has arrived at the conclusion that in this municipal area there does not exist any persons who makes these kinds of objects” (Swift, n.d.[a]). It is clear that the scope of this alleged fraud is many times greater than that of any fraud ever perpetrated in the past. It would require an exceedingly great range of knowledge of Indian culture, and a not inconsiderable knowledge of paleontology. It would require also an inexhaustible power of imagination (for the objects are not imitations of known models) and an uncommon skill at sculpture (1955, 5:3). No family in the area was ever discovered that possessed this kind of skill or knowledge. Recent discovery of fossilized sauropod (diplodocid) skin impressions reveals a significantly different appearance for these dinosaurs. The fossilized skin demonstrates that a median row of [dermal] spines was present.... Some are quite narrow, and others are broader and more conical (1992, 20:1068, emp. added). In 1992, it was discovered that sauropods did have spines or spikes. The Julsrud collection was discovered between 1945-1953, over 40 years prior to Czerkas’ discovery. If a person attempted to fake the figurines, he would not have put spines on the backs of sauropod dinosaurs. Yet, even a cursory inspection of photographs from the Julsrud collection shows that the sauropod dinosaurs in the collection have spines. Pictures in Gardner’s book show spiked sauropods in the collection, and his book was published in 1969, 23 years before the Czerkas’ discovery (Gardner, 1969, pp. 9-11). 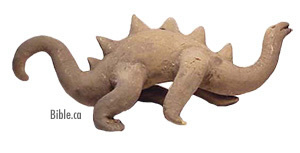 Furthermore, the spikes on the sauropod figurines match the description of those found from recent skin impressions. Ellen Morris Bishop wrote: “The biggest spines found were about 9 inches long, shaped a little like a shark’s dorsal fin. The smallest, at tail-tip, were about 3 inches high” (1993). The logical explanation as to how the Julsrud figurines possess accurate dinosaur anatomy unknown until 1992, is simply that the ancient artists who produced the figurines saw the dinosaurs and interacted with them in ways congruent with the figurine depictions. Concerning the Julsrud collection, John Tierney correctly noted: “Nevertheless, the collection is a reality which threatens the orthodox concepts and time scales in many fields of study. It is no wonder there has been such determined opposition by dogma-bound academics” (1994a, 1:16). When all the evidence is critically assessed, the Julsrud collection provides powerful evidence of the co-existence of humans and dinosaurs. Eugenia Cabrera is currently the Director of the Ica Stone Museum located in Ica, Peru. Her father, Dr. Javier Cabrera, starting in the 1930s, collected most of the 11,000 Ica stones that fill the museum she directs. The stones are controversial, to say the least. Depicted on the stones are what appear to be relics of an ancient Indian culture that predated the Incas. Many of the carved stones exhibit mundane scenes that would be expected in any ancient culture. But some of the carvings portray humans in close contact with dinosaurs. Scenes of men hunting dinosaurs, riding dinosaurs, and leading them by ropes around their necks present a glaring problem for the evolutionary scenario that humans and dinosaurs were separated by millions of years. Because of the dinosaur carvings on the stone, the evolutionary scientific community has labeled the entire collection a fraud. Of course, that is exactly what would be expected, since the authentication of the stones would effectively annihilate decades of evolutionary propaganda as it relates to dinosaurs. Gainsayers of the stones present several lines of evidence that they believe debunk the stones. They say the carving on stones cannot be dated accurately because, while the stones could be dated using standard geological dating methods (which, as noted below, are based on several unprovable assumptions, see DeYoung, 2005), the carvings on the stones cannot be dated. Those who reject the authenticity of the stones also point to stones that have been faked and use them to discount the entire collection. Are the Ica stones frauds, or are they an amazing archaeological discovery that adds considerable evidence to the idea that humans lived with dinosaurs? A brief look at the salient points in the discussion reveals that the Ica stones are, in fact, authentic evidence for the coexistence of dinosaurs and humans. Those who discount the stones have raised some serious objections to their authenticity. Each of those objections can be answered sufficiently to show that they do not militate against the genuineness of the stones. While it is true that the carvings cannot be dated using standard geological dating methods, this fact does not disprove the stones’ authenticity for several reasons. First, the standard geological dating methods are fraught with error. They often render results that are known to be incorrect by millions or billions of years (DeYoung, 2005). Furthermore, this line of reasoning would force archaeologists to reject all ancient carvings on any type of stone. Obviously, this is not how the study of ancient artifacts proceeds, so other considerations must be factored into the dating of any ancient carving. Other questions must also be considered: Where was the carving found? Does it exhibit knowledge of a culture or fauna that would be difficult for modern carvings to obtain? Does the carving show the wear of many years? Is there patina or other natural build-up in the grooves of the carving? Etc. It is true that some of the Ica stones are fakes. Does this fact, however, force an honest investigator of the stones to reject the entire collection? No, it does not, for at least two reasons. First, if a stone is identified as a fake, there must be a way to prove it is fake. It must have fresh cut lines, no signs of patina, no carved information that would be impossible for a person in modern times to obtain. If these same tests are applied to other stones, and those stones show signs of ancient wear, grooves that are not freshly hewn, and knowledge unavailable to modern carvers, then the authentic could be distinguished from the fake. Second, in other areas of life, it would not be acceptable to toss out legitimate articles based on the existence of fakes. If someone discovers a fake Rembrandt, should all Rembrandts be dismissed as frauds? Certainly not. Third, the fact that some stones are fakes could suggest that original, authentic stones exist as the models for the fakes. Fourth, if finding a forged stone would disprove the entire collection, what would stop a militant atheistic evolutionist from simply faking a stone or paying someone to do so? It certainly would not be surprising for those opposed to the biblical account to cast suspicion on the collection using fake stones. A classic rhetorical tactic is to build a straw man that does not accurately represent the complete argument, tear it down, and then claim victory. Rejecting the entire collection, based on the fact that there are some faked stones, is nothing more than a straw man argument. Fifth, the stories of alleged forgery fail to deal adequately with the prodigious number of stones that have been collected. Supposedly, a farmer named Basilio Uchuya and his wife Irma manufactured multiplied thousands of the stones and sold them to Dr. Cabrera. Yet, the site from which they allegedly quarried the stone is far too small to have yielded the massive amount of rock necessary for the collection, especially in light of the fact that many of the stones were large boulders that weighed several hundred pounds each. Along these lines, Swift noted: “Such an enormous quantity of stones would have required an excavation on the scale of an open pit mine. It seems reasonable that they would have needed a vast array of modern equipment.... The sheer magnitude of such a mining operation would have left a huge crater. There is no way that such an operation could have escaped detection...” (n.d.[b], p. 24; see pp. 23-27 for more extensive material). This stone had a heavy coat of patination and oxidation. Microorganisms could be seen in the grooves and the incisions. There is a uniformity of coloration and weathering. The incisions and cuts are as dark and weathered as the rest of the stone. There are several thick concentrations of salt peter that are so full of salt buildup that it covers parts of the carving with a white layer obscuring the image below.... There is notable irregular wear on the edges of the incisions that leads one to the inescapable conclusion that this stone had undergone considerable wear.... The salient conclusion of the laboratory is that the stone is of some age; in fact of antiquity of hundreds or thousands of years old (n.d.[b], p. 71). When submitted to microscopic analysis, the forged stone carved by Uchuya was easily distinguished from the ancient stone as a modern creation. Tiny pieces of metal from the tool Uchuya used were readily visible. The shallow scratches and chips were “clean and angled. There was no patina or film of oxidation on the stone; no microorganisms or salt peter were found on the stone. The laboratory conclusion was that the stone was of recent manufacture” (n.d.[b], p. 69). Just like a counterfeit dollar bill, the known forgery was easily distinguished from the authentic stone found in the tomb. Second, the stones exhibit numerous depictions of dinosaurs, many of which are sauropods. Interestingly, the sauropods have dermal spines just like the Acambaro figurines. 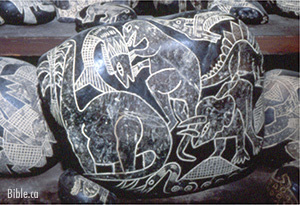 Allegedly, the stones were carved by modern forgers in the 1950s and 1960s, who gleaned their ideas of dinosaur anatomy from movies, comic books, and magazines. But dermal spines on sauropods were completely unknown at that time. It was not until Czerkas’ discovery of fossilized skin impressions in 1992 that the modern world learned of the conical dermal spines that adorned the backs of sauropods. In the 1975 edition of his book El Mensaje de las Piedras Grabadas de Ica (The Message of the Engraved Stones of Ica), Dr. Javier Cabrera wrote extensively about the stones and included numerous photographs of them. While many of Dr. Cabrera’s ideas about aliens associated with the stones are quite bizarre, the concrete evidence portrayed in the pictures is not. Several pages contain pictures of sauropod dinosaurs that have the median row of dermal spines mentioned by Czerkas (1975, p. 36-37, 65, 95, 97, 99,101). Many of the stones were found long before 1975, but the pictures are in a book published in that year, and thus must be at least 17 years prior to Czerkas’ discovery. How would alleged forgers have known to put dermal spines on the sauropods? The most reasonable explanation is simply that there were no forgers. Ancient people saw the dinosaurs, interacted with them, and carved accurate pictures of them in stone hundreds of years ago. If humans and dinosaurs lived together on the Earth in the past, what would you expect to find to verify their cohabitation? One line of conclusive evidence would be a series of carvings or drawings accurately depicting dinosaur anatomy that could be shown to have been produced before modern information about dinosaur anatomy emerged. The Stegosaurus carving in Cambodia, the dinosaur carving found by Samuel Hubbard, the accurate dinosaur petroglyph on Kachina Natural Bridge, dinosaur figurines discovered by Julsrud and studied by Charles Hapgood, the Ica stones, and various other carvings, figurines, and ancient art that we have not had space to include, converge to form a mountain of physical evidence that is exactly what would be expected if humans saw live dinosaurs. Evolutionists have used dinosaurs long enough to teach their false worldview. It is time we take dinosaurs back, and use them to teach about the awesome power of the One Who created these magnificent creatures. Bishop, Ellen Morris (1993), “Utah Paleontologist Develops New Look for Sauropod Dinosaurs,” Oregonian, January 14. Cabrera, Javier (1975), El Mensaje de las Piedras Grabadas de Ica (The Message of the Engraved Stones of Ica) (Lima, Peru: INTI-Sol Editores). Czerkas, Stephen (1992), “New Look for Sauropod Dinosaurs,” Geology, 20:1068-1070. DeYoung, Donald B. (2005), Thousands...Not Billions (Green Forest, AR: Master Books). DiPeso, Charles (1953), “The Clay Figurines of Acambaro, Guanajuato, Mexico,” American Antiquity, 18:388-389. Gardner, Erle Stanley (1969), Host With the Big Hat (New York: William Morrow). Hapgood, Charles (1955), Reports From Acambaro (New York: Fieldstone School). Hapgood, Charles (2000), Mystery in Acambaro (Kempton, IL: Adventures Unlimited Press). Harmer, Lowell (1951), “Mexico Finds Give Hint of Lost World: Dinosaur Statues Point to Men Who Lived in Age of Reptiles,” Los Angeles Times, B1-B2, March 25. Pezzati, Alex (2005), “Mystery at Acambaro, Mexico,” Expedition, 47:6-7. Russell, William N. (1952), “Did Man Tame the Dinosaur?,” Fate, 5:20-27. 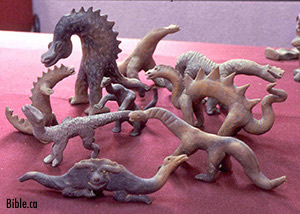 Swift, Dennis (no date[a]), “The Dinosaur Figurines of Acambaro, Mexico,” [On-line], URL: http://www.bible.ca/tracks/tracks-acambaro.htm#photo. Swift, Dennis (no date[b]), Secrets of the Ica Stones and Nazca Lines (Dinosaur Institute). Tierney, John (1994a), “Coming Soon Near You: A Real Live Jurassic Park,” World Explorer, 1:15-18. Tierney, John (1994b), “Pseudoscientific Attacks on Acambaro Artifacts: The Ceramic Technology of Intellectual Suppression,” World Explorer, 1: 52-61.